The designer for the G.V.G.V. house, MUG, graduated from Kuwasawa Design School and launched her line in 1999. She has participated in shows such as the Designer's Invitation Project (2007) hosted by UNIQLO and the Designer's Invitation Project for UT (2008). You can visit her website here for more information! The room was full and there were double rows of people standing behind the seats. As the lights went down, there was silence. Two screens showing bare, dark trees, shifted and moved and the show began. It was a Fall collection of faux fur vests, tall boots, leggings, caps and blacks, greys and whites with some muted blues and pinks. Skirts and dresses were short and fitted. Shoulders were big and padded, while sleeves were futuristic. Cloaks were in evidence as were pockets, belts big buttons and shiny zippers and glittering sequins. Fringes were details on tops, boots and hems. MUG is all about creating looks where masculinity and femininity exist. 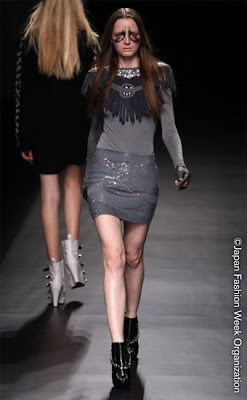 The masculine booties, buckles, and futuristic cuts were balanced with soft feathers and rhinestones. The mixing of textures in the collection as well as the dramatic eye make up made for an exciting show! 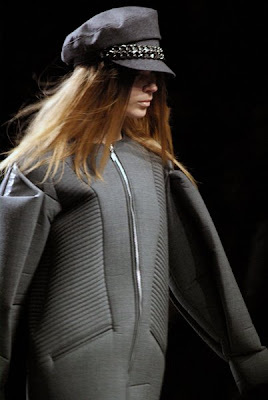 A very futuristic looking jacket! Look at the buckled boots! Ditto on the buckled boots. I also like that black jacket its paired with, a little more subtle than the futuristic once before, lol. love the skirt in the 6th picture! I was looking forward to this! Love that print in the first photo. .
great review honey,yummy boots. I like the structure of the pieces sweetie. Great pictures, thanks for sharing with us... Love the futurist coat , the neoprene one, pretty cool! Excellent photography! The boots are cool.